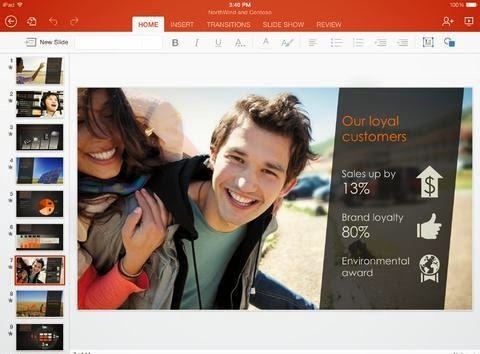 Download PowerPoint for iPad: The Microsoft PowerPoint app offers a easy way to create and view PowerPoint presentations and slides on your iPad or iPhone. The PowerPoint app including the Word and Excel apps are part of the office suite recently released by Microsoft for iOS. The app includes most of the features that the PC version offers and you can also sync your beautifully designed presentations on multiple devices. You can download the PowerPoint app for free from the App store but to use the app you need to purchase a office subscription which costs around $100. You don't require the subscription if you download the app for your iPhone.